The ultimate summer smoothie is here! This is so refreshing and delicious you’re not going to believe it. 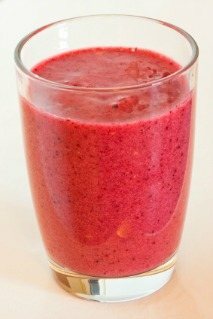 If you’re craving something sweet that tastes like dessert, yet is quite healthy, give this smoothie a try. It will cool you off on a hot summer day, and is a great replacement for sugar laden popsicles for kids. Pour this smoothie into an ice cube tray or molds for healthy, homemade popsicles. What health benefits does this smoothie have to offer? Watermelon and raspberries are both high in vitamin C, which packs a big antioxidant punch. Combing these tasty fruits will also provide a good amount of magnesium, potassium, manganese, and vitamins A & K as well as smaller amounts of other nutrients. Both fruits are also good for your eyes and offer protection against macular degeneration. I made the basic version of this smoothie with 1/2 cup fresh blueberries, but next time will incorporate additional fresh or frozen fruit. You can get really creative with this dude. Enjoy! Load all of the ingredients into your high speed blender and blend for anywhere from 30-45 seconds – or until the desired consistency is reached. Please leave a comment below if you try this refreshing raspberry watermelon smoothie. Happy Blending! Made this for my kids and myself. They LOVED it!